Most likely my favorite Ultima game of all Time. 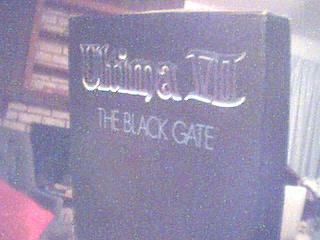 A close contest with Ultima V, but I sold U5 years ago before I realized how much I might miss having it in the future. However, this will do. A little history. I first played Ultima I on the Apple I, God knows how many years ago. I had the disk for a long time, in a huge pile of other games, but plugged it in the computer one day to see what it was, and fell in love with the game. Many years later, I purchased Ultima IV for the IBM PC, spent hours, DAYS even playing that game, all the way to the end, but never got the final password (Infinity). When a friend told me, I spent almost 48 hours straight playing from the beginning to win, just to see the ending sequence. Then I got U5 for Xmas when I was 14. Played that game a bit, but didn't have the facination at first. But as I kept playing, I discovered the deep storyline in the game. I can't recall my excitement the day I found the password for the Resistance. Man the trouble I had to go through to find that! U6 was mostly a disappointment for me. The graphics were great, but the version I had was rather buggy and sound didn't work on my Adlib, and the story was harder to follow. I eventually just gave up on it. Bought U7 in my Sr. year of High school. FELL IN LOVE WITH IT! It was slow on my 386, but I played it as much as I could, even with all the trouble I went through to get it working. This game started what was hopefully going to be a great trilogy. However, it was the last of a great series. Ultima 8 was a disappointing mess. And then the farce that was Ultima Online came out, and killed the development on U9. EA screwed Origin into the ground, and after the release of U9, finally, a disappointment I've yet to play, Richard Garriot quit. The man who's creative genious started the series walked away from his legacy. The series lives on. Fans around the world still play the games, and many projects are underway to restore, update, improve, and redo many of the ultima games, to keep the greatness alive forever.